CHINA’S largest inland saltwater lake is expected to attract a large number of tourist as ice begins to melt on the lake surface. Qinghai Lake, situated in Northwest China’s Qinghai Province, goes into a “frozen period” every mid-December and completely melts in mid-April. “The west side of the lake and several rivers to the lake’s north are beginning to melt,” said Wu Yonglin with the protection station of the southern bank of the Qinghai Lake National Nature Reserve. 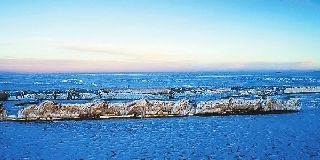 As the yearly frozen period ends, the lake’s surface ice begins to thin, break and melt, and the lake typically turns itself from an icy land into vast green water. As temperatures rise, some icy layers are broken by ferocious winds and pushed to the shore. The view often attracts many visitors.